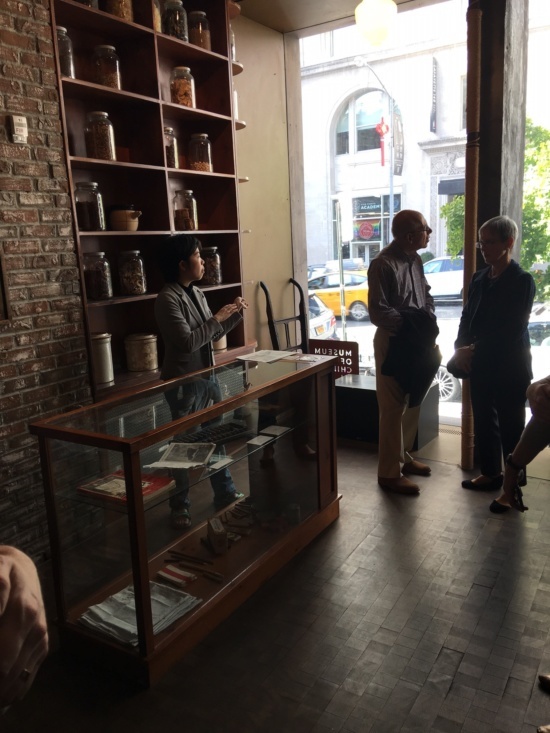 On an unseasonably warm Saturday, Archtober got a tour of the Museum of Chinese in America (MOCA) in Manhattan’s Chinatown, revealing the design thinking behind the museum and how it operates today. The adaptive reuse of the ground floor and basement, the two floors rented by the museum in what is otherwise an office building, was carried out by Maya Lin Studio and Bialosky + Partners Architects. Our tour guide was Alina Shen, Museum Educator at MOCA. Our tour began outside, as Shen pointed out the 1915 building’s original façade and discussed the ground floor renovation. The 14,000-square-foot building used to be the Grand Machinery Exchange, one of 40 used-machine dealers on the block, which in the early 20th century attracted buyers from across the country. At the ground floor, the architects transformed the industrial façade with large spans of glass. Closely attuned to the neighborhood and the museum’s mission as a repository of Chinese-American history, Lin’s design incorporated text as a way of harkening back to text-laden signs of Chinese-American-owned businesses nearby. When the tour moved inside, Shen described the museum’s history and mission. In the 1980s, cofounders Jack Tchen and Charlie Lai noticed that many objects, such as cabinets and photographs, were being left on the curb throughout Chinatown. 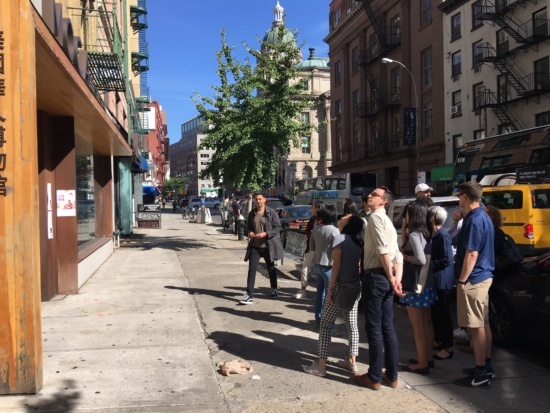 They began collecting and archiving the objects, and after some research realized that many stores in Chinatown were approaching the end of their 99-year leases. Tchen and Lai created the Chinatown History Project as a way of preserving the memory of these spaces and the older generation of Chinese-American residents. 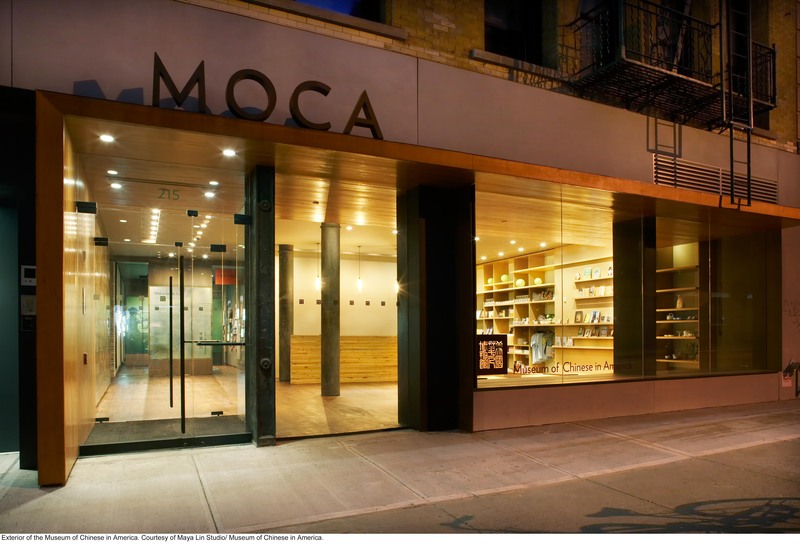 The project eventually grew into MOCA. Formerly located at PS 23, the museum moved into its new digs in 2009, increasing its space six-fold. The lobby, filled with natural light from the glass façade, uses many recycled materials, including much wood, which mixes well with the exposed brick walls of the building. Moving back from the lobby, Shen showed us the “courtyard,” which despite its name is more of an atrium with a large skylight overhead. The space starts in the basement – down recycled-wood stairs from the ground level – and spans three floors. The courtyard also brings in crucial natural light and some interior views to the galleries, which are all housed on the ground floor. MOCA’s basement level houses restrooms and administrative and education spaces. Our tour continued through the exhibition spaces, laid out in a vague U-shape around the atrium. The first five galleries contain the permanent collection, which tells the story of Chinese in America with a special focus on Manhattan’s Chinatown, and ends with a fascinating meditation on the urban patterns of the 21st century, from traditional Chinatowns to more suburban settings in New York and Los Angeles. Parts of the display tell the stories of prominent Chinese Americans, while others focus on ordinary people to delve into the social makeup of Chinese American communities at various points in time. A timeline runs along the base of many of the display walls, and drawers invite the visitor to interact with the space, continuing the Museum’s goal of being dialogic rather than monologist. 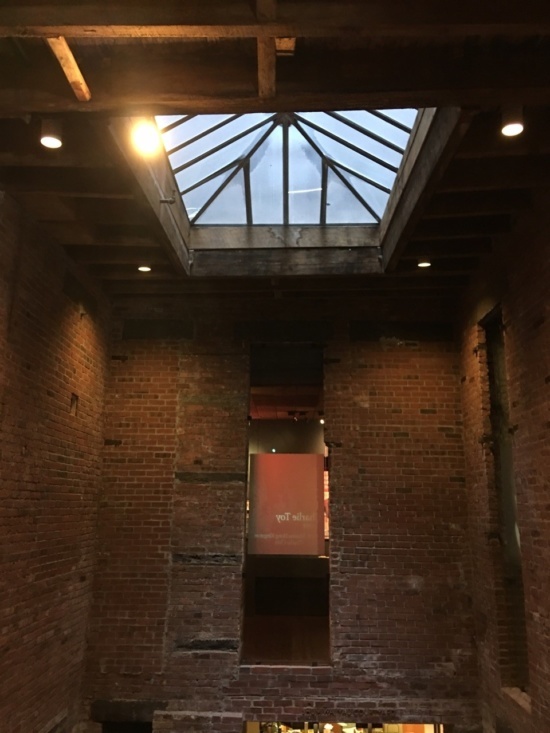 The innermost space in the museum faces Lafayette Street, straddling the border between Chinatown and Nolita, thus speaking to the issues of gentrification and transition of many urban ethnic communities. This room, which has an elegant tin ceiling and an end-grain wood block floor, also includes cabinetry saved from stores in Chinatown that were closing, complete with dried herbs and spices. This liminal space emphasizes the fact that the museum, like Chinatown, is an evolving rather than fixed entity, a concept echoed throughout the design.